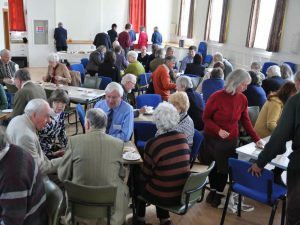 The topics of recent Presidents’ Symposia have generally sounded ‘comfortable’ – seaside, churches, the inspiration of Devon, wildlife and health. Chris Cornford’s 2015 Symposium, held at the Mint Methodist Centre (Exeter) on Saturday 11 April 2015, was anything but. 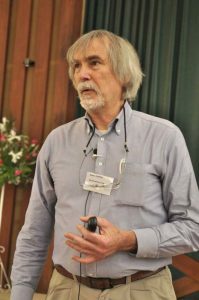 Chris, a petroleum geologist who ran a field centre for many years, is well aware of the conflicting economic, ecological, ethical and practical issues that confront Devon, Britain and the world as populations grow, energy demands rise and the climate undergoes apparently unavoidable and destructive change. His Symposium brought together four speakers particularly well qualified to address different aspects and approaches to energy production and economy in Devon in the next 15 years, as we move – hopefully – to a low carbon future. Chris himself gave both the first and the concluding talks. His introduction discussed published predictions for Devon: population, age distribution, employment, economic development, energy needs, transport pressures and energy sources. Such predictions are only as good as the data on which they are based, but they can be useful and are probably indispensable whether or not they prove correct. He next addressed the range of potential energy sources, and their relative Load Factors: the fraction of time in which they deliver energy: c. 0.3 for wind, 0.1 for solar and so on, varying with the locality. Load factors become irrelevant if energy can be stored efficiently for later use, so developing new storage devices is of the greatest importance, and Chris listed a number of approaches presently being explored. Two seem particularly promising: flow batteries, which combine aspects of conventional batteries and fuel cells, and energy stored kinetically in high speed, low mass flywheels, operating on magnetic bearings in a vacuum to minimize friction. 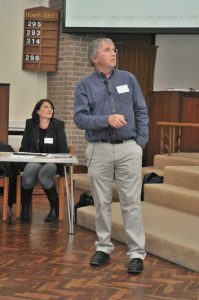 Chris ended with Devon County Council’s predictions on their own energy use to 2020, which will rise appreciably if no fuel economies are undertaken, but could be reduced by 15% if they were. 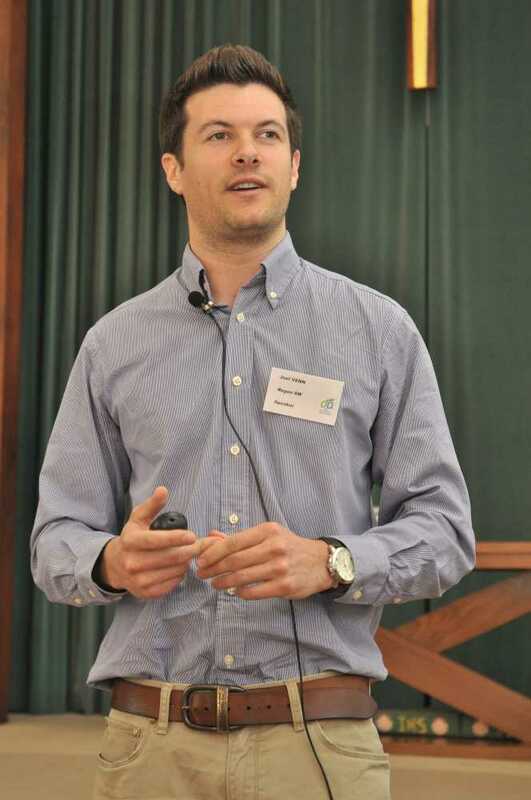 The theme was taken up by Joel Venn of RegenSW, a not-for-profit organisation working with industry, communities and the public sector to overcome barriers to the development of renewable sources and energy efficiency. In an excellent summary of Devon’s existing energy supplies, he told us that, contrary to the audience’s expectation, energy use in Devon has declined since 2005, and is expected to continue to do so. However, three quarters of the energy used comes as petroleum and gas, and most of the rest as electricity, and of the £23 billion estimated to be spent on these in Devon in 2015 almost all will leave the county. Renewables – solar, onshore wind, biomass and landfill and sewage gas – provide the very few energy sources from which the income remains in Devon. Their use has risen dramatically since 2008, with Devon providing 11.5% of its electricity in this way in 2014. In the South West as a whole, renewable energy provides over 10,000 jobs, with the potential to deliver 34,000 by 2020, and Devon, with abundant renewable resources, is leading the way. However, in Europe as a whole only Malta and Luxembourg are producing less renewable energy than the UK as a percentage of gross consumption… Shameful. 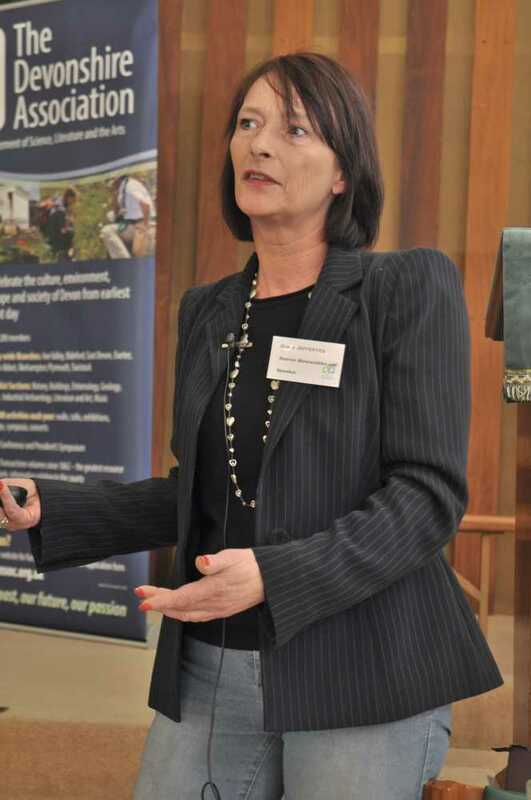 Solar PV (Photovoltaic) cells currently provide the largest component of Devon’s renewable energy, and Grace Jefferyes, of Source Renewable Ltd, told us of the rapid growth in solar PV production in the last few years. However, and startlingly to most of us, the capacity of the Grid has now been reached, and Western Power Distribution are putting restrictions on new grid connections, which will almost certainly prevent the target of South West solar energy production by 2020 from being reached. 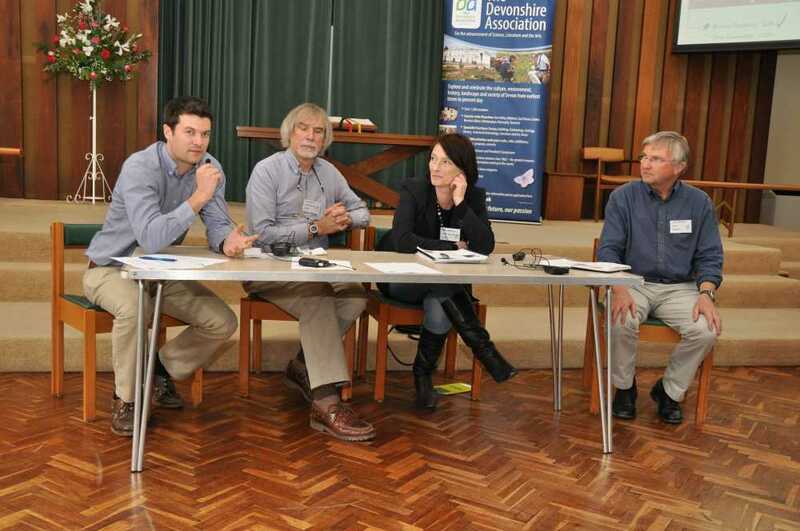 Back then to Joel Venn for an account of Devon’s wind energy resources. In 2014 onshore wind generation provided 30% and offshore wind 20% of the 19.2% of electricity supplied by renewable sources in the UK. The UK is the world leader in offshore wind generation, but this is currently irrelevant to Devon, as offshore projects are indefinitely on hold. Over 60% of the surveyed public are in favour of wind power, but on average believe government subsidies to be 14 times the actual figure. Wind generated energy has risen by 52% since 2012. Devon is second only to Cornwall in the production of onshore wind energy in the South West, due largely to the Fullabrook wind farm near Barnstaple. Onshore wind provides about 5% of Devon’s electricity consumption and 1% of the county’s total energy, about equivalent to 75,000 households’ typical annual energy use. Joel’s estimate is that this could, if encouraged by Government, rise to 30% of Devon’s energy consumption by 2030. 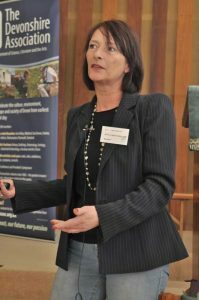 But since the Symposium there has been a General Election…..
After lunch, Grace Jefferyes resumed, to discuss Devon’s potential generation from ‘biomass’ and anaerobic combustion of methane and food waste. Waste disposal is a growing problem, and energy production from the incineration and digestion of organic refuse is clearly a good idea. On the smaller scale, biomass burning is encouraged and subsidised by the Renewable Heat Incentive. 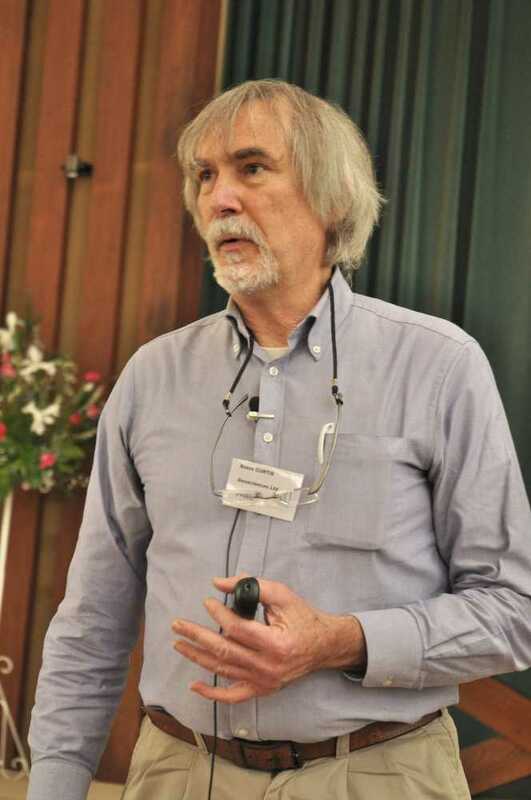 There is considerable demand from landowners, especially those with woodland, and domestic biomass boilers are also being actively promoted. However the equipment is expensive, and the demand for fuel far exceeds local supply. In consequence biomass pellets are routinely imported from the US and from Russia and transported across the UK – hardly carbon-neutral. The current rate of installation will probably continue, but RegenSW predictions indicate that energy from waste will fall well short of 2030 targets. Anaerobic digestion of food waste is nationally slowing, but Devon provides about 20% of the electricity and 8% of the heat supplied in this way in the South West. Holsworthy leads the way! 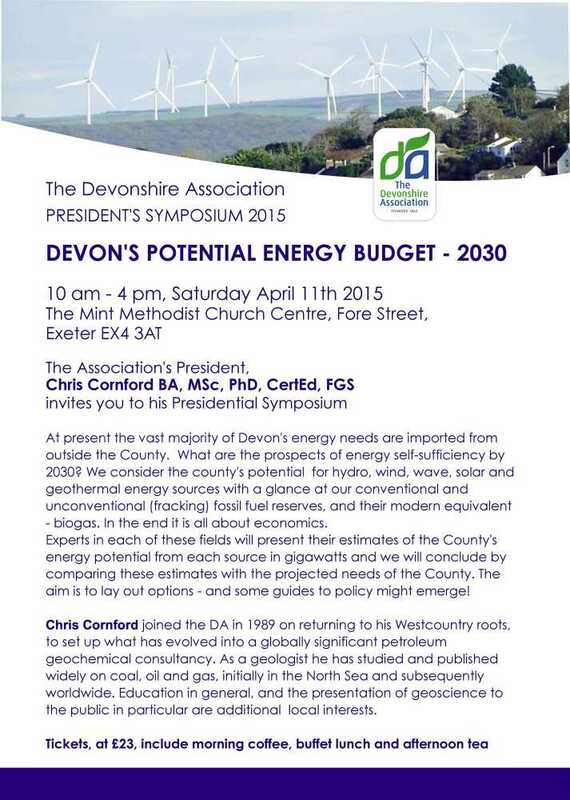 Dr Robin Curtis, of Geoscience Ltd, discussed Devon’s geothermal energy potential to 2030. Geothermal energy is theoretically always available, but tapping deep, high temperature sources economically is restricted to volcanic hot spots – hardly Devon, though there have been initiatives in Cornwall where the granite is hotter. More promising is the extraction of heat from relatively near the surface for individual houses – pioneered in Noss Mayo. All that is necessary seems to be a house, a hole in the ground and a simple pump. This uses some electricity, but the heat extracted more than compensates. Every house should have one. We had much to consider, and discussion was lively. This was in my view one of the best and most important Symposia we have yet had, and it is sad and ironic that attendance was well down on most previous years despite better than usual publicity. Why? The Grand National? Reluctance to confront controversial issues? Fear of civil disturbance? Lack of interest? ‘It won’t affect us – we won’t be here’? As one – younger – member said to me in the lunch break: ‘Don’t they have grandchildren?’. All photos on this page courtesy of Antony T. Buller. Click on them to see larger versions. Conditions of reuse are here.